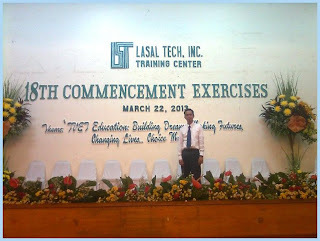 Our youngest son, Gilbor Camporazo, Jr., graduated from his Computer Programming NC IV course with three special awards in a recent 18th commencement exercises of La SalTech Training Center at the Garden Royale, Kundutel, Bacolod City. Gilbor Junior was one of those 258 LaSalTech graduates who had satisfactorily completed their academic requirements prescribed by the vocational technical course of the Department of Education. 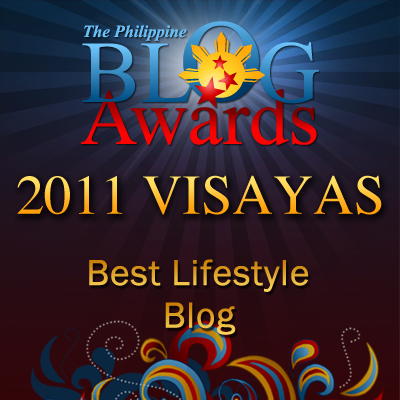 He received in a row the 3 awards like the "Best in Programming," "Best in Web Design", and "Best in System Project". Director Lorena T. Yunque, TESDA Provincial Director was the invited inspirational speaker. Addressing the graduates, she checked them whether they are ready. "Are you ready?" she asked. Readiness, according to her, is concomitant to success. It spells out the opportunity, that is, getting ready to join the world of work. She believed that LaSalTech graduates are ready. "Our hope, our expectation, our prayer that you are ready for this opportunity," she expressed. She told some of the guidelines for success which may include a clear vision, discipline and determination coupled with aggressiveness to achieve their "dreams" which consist of series of actions to achieve them. On the other hand, LaSalTech school administrator Teresita T. Villanueva before she relayed her message on "mother's hand" which is about a young man who applied for a job, then passed the interview and got the job, encouraged every graduate to always be of service to others. She informed that those who will graduate come from the courses of visual graphic design NC III, Programming NC IV, and Computer Hardware Servicing NC II.They come from the branches of LaSalTech Bacolod, Cadiz, Kabankalan, and La Carlota. Earlier, a Baccalaureate mass was officiated by Fr. Arnold P. Deletina. In his homily, Fr. Deletina asked the graduates what they are to invest and when to do it. He reminded everyone that the best to do good and to change is now and the greatest investment is love. By the way, TESDA provincial director Yunque in closing urged the graduates to a "person of Value" for it is the character and attitude that really matter. After their Baccalaureate mass, our son came over to us and turned over his words of appreciation written and put inside in a nice small frame. The content reads as follows: "
"The symbol of love is given to my cherished mama and papa whose unending love, compassion and noble sacrifice ave made possible of what I am now. "You have willingly offered the path in the walks of my journey to see for knowledge. You have always been a constant guiding light and inspiration to my dreams. Your utmost understanding and support serve as my refuge in times of trouble and frustrations. I shall forever remember this in my heart. "Your triumph now is complete..."
In like maner, his mother and I are so much grateful to the Schools Division Superintendent Portia M. Mallorca of the Division of La Carlota City, Department of Education (DepEd) for her support and guidance to our son who conducted his on-the-job training (OJT) at the Division of La Carlota City. 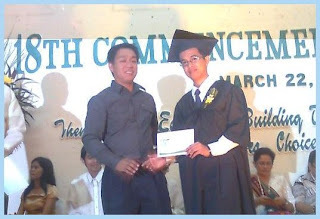 Ma'm Mallorca has relied so much upon the programming skill of our son who prepared, designed and encoded the webpage of the La Carlota City Division which is under construction pending the needed contents. That is the first web design made by our son for an educational institution like the DepEd La Carlota City gratis et amore. We are also thankful to the Division Planning Officer, Francisca "Pakit" Nabor for her support and constant companionship with our son, and also to the other office mates like Ofelia Flores, Sylvana Baldomero, and Sally Senayo for their camaraderie with our son while he was still undergoing an OJT at the Division Office. Congrats to your youngest son. You really built him to be successful. Thanks Franc. That's the only legacy we could give him to have a better if not the best education and in return he has given us the honor, the prestige and the integrity of having him as our youngest son. 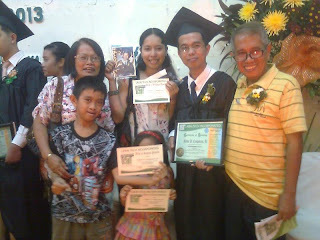 Congrats to your youngest son Sir :-) What an honor to receive those awards and am sure as a Dad, you are very proud of him. Congratulations Sir Gil, you raised a good son and with his academic achievement I am pretty sure he will go places. Isn't it very rewarding having children like yours. God is really good.